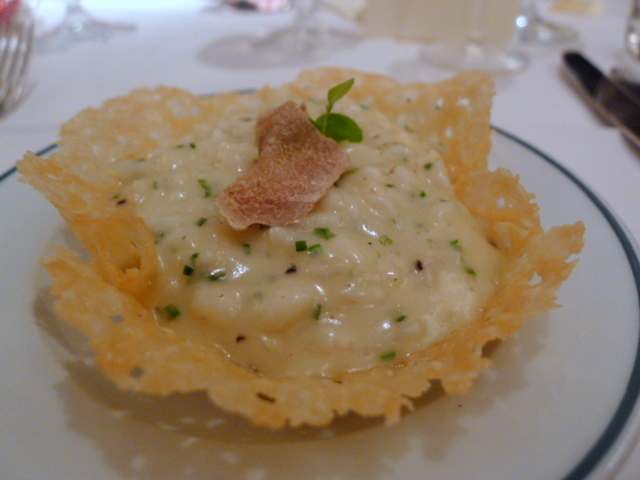 A parmesan and white Alba truffle risotto finished with chives and served in a parmesan shell (matched with Bergerac Cuvée des Conti, Chateau Tour des Gendres 2009) was deliciously creamy, rich and satisfying. The shell was also a nice touch. 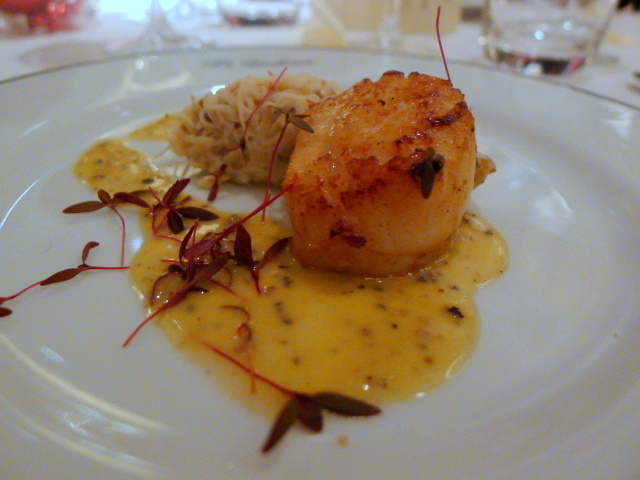 Next was a beautifully cooked seared hand-dived scallop served with an apple, celeriac and truffle remoulade (matched with Reisling Framingham, Marlborough New Zealand 2008). The remoulade was nicely tart, if a little cold. 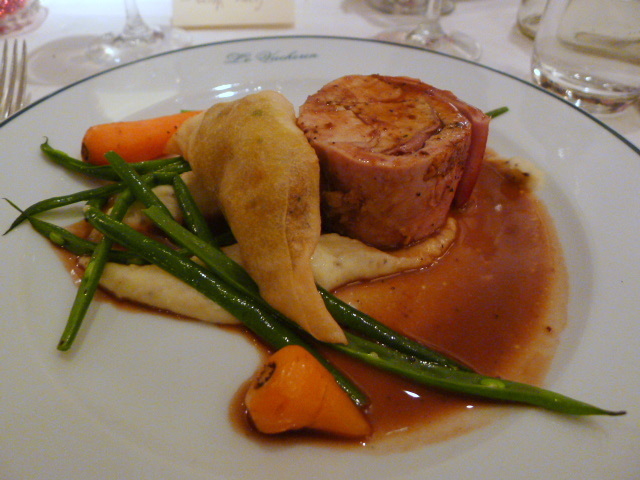 The main, a ballotine of wild rabbit and rabbit liver (matched with Château Lamothe Cissac, Cru Bourgeois Haut-Médoc 2002), boasted a nice flavour, but was a little dry in parts. The jus and accompanying pastille of confit rabbit leg and pomme mousseline were tasty, but it was difficult to detect the truffle in the dish. Otherwise, this was a hearty, rustic course. 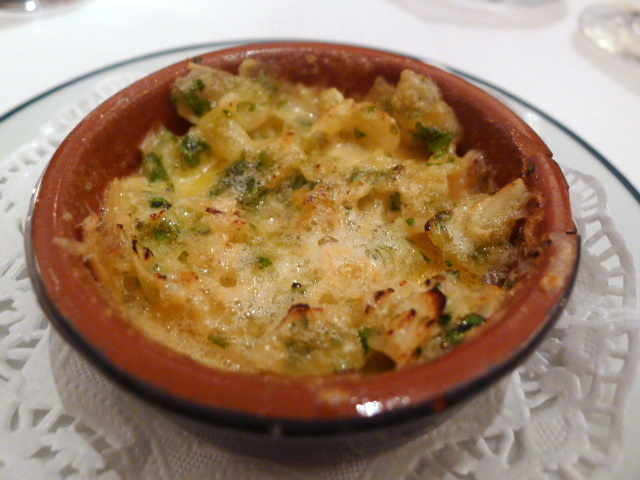 As expected, there was vacherin on the menu. Baked with truffle and an almond crust (matched with Fitou Jean de Pila, Domaine Roudene 2008), the cheese was lovely, but the dish was unbalanced as there was not enough cheese and too many almonds. A dessert of chocolate and white truffle macaroons and truffle honeycomb ice cream (matched with Banyuls ‘Les Clos de Paulilles’) was resoundingly successful. 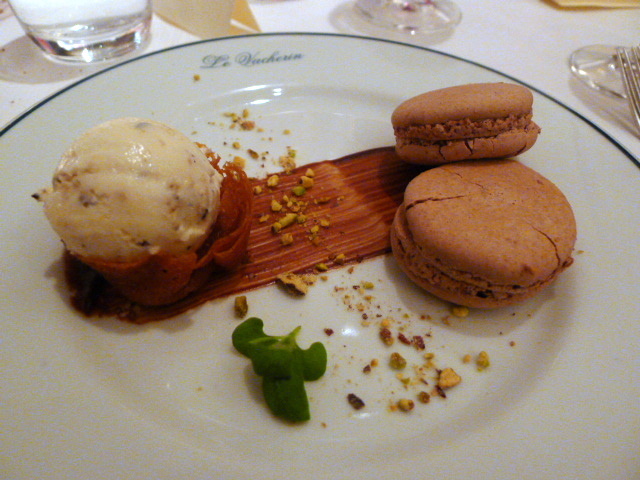 Although slightly cracked, the macaroons were well made with a soft gooey core. There was a nice hint of truffle running through the ice cream which was delicious. To finish were chocolate truffles with a touch of truffle which were fantastic. The service was efficient and impressive given the number of courses and the number of covers. There might have been a few small niggles here and there, but this was a sound and thoroughly enjoyable meal. The cooking was solid, and the produce used was excellent. 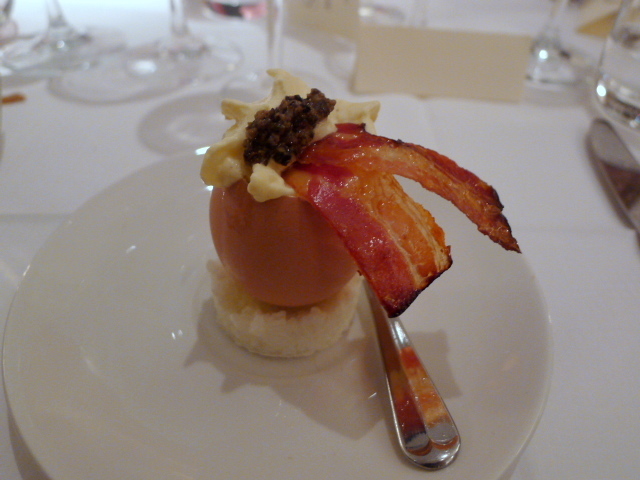 And to have truffle in each course with wonderful matching wines for only £85, including service, was excellent value. Price range: This menu cost £85 including wines and service. £30 – £50 for three courses from the a la carte menu which excludes drinks and service. Hi Su-Lin, I guess this menu wasn’t the cheapest… But considering the number of dishes we got and the amount of wine, it was very good value.